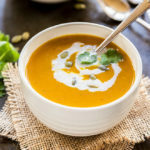 Spiced Carrot Soup is healthy, delicious & vegan! 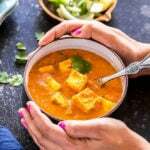 This soup is spiced with little cumin & curry powder and will become your new favorite! Happy Monday! How was your Valentine’s Day weekend? Did anything special? 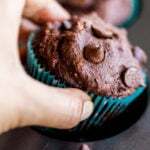 Baked something? I hope you guys did bake something from my blog. I baked so much before for my blog that I actually didn’t bake anything on the 14th! That’s what always happens with me and I know all my blogger friends would understand this. We always have to prepare in advance and by the time the actual occasion is there, you are like I am done with this! Ha! My hubby cooked lunch for us and it was awesome, I don’t think there could have been a better way to celebrate! Now that we are done with desserts for a bit, let’s focus on simple food. You know the kind of food that you can eat everyday and not get bored. Yes this spiced carrot soup is exactly that. And it’s vegan too! 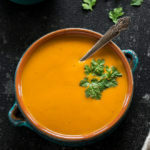 I make this carrot soup pretty regularly, actually I make soups very often these days and the no.1 reason for that is not the weather but my immersion blender! Seriously I don’t know how was I living without one till now! I am so much in love with my immersion blender, it has made my life so much easier and ever since I got it, I am on a soup making spree. If you guys don’t have an immersion blender, you seriously don’t know what you are missing out in life. You really need one! Anyway my love for immersion blender aside, let’s talk about this soup. This spiced carrot soup is really easy to make. All you have to do is saute some ginger and onion and then add carrots. Add coconut milk, water and cook carrots till they are soft and done and then add spices and blend. And that’s it, your delicious and healthy carrot soup is ready in no time. I actually had a spiced carrot soup for the very first time at Whole Foods. I think they call it Thai Ginger Soup? I remember I loved it so much then and ever since I wanted to make one at home. My spiced carrot soup is definitely inspired from that soup! I hope you guys like it and give it a try! Heat 2 tablespoons of oil in a pan on medium heat. Once the oil is hot, add chopped ginger and onion. Saute for 2 minutes or till the raw smell of the onion goes away. Add diced carrots, some salt and mix. Cook for 2 minutes. Now add coconut milk, cumin powder, curry powder, cayenne pepper and mix till everything is combined. Also add water and cover the pan. Let the carrots cook for 15-20 minutes or till they are very soft and completely cooked. At this point puree the soup using immersion blender or wait for the mixture to cool down a bit and then puree in your regular blender. Also adjust the seasoning at the point. You might want to add more salt or cumin or cayenne! Also add little sugar if you want, this is optional. Once the soup is pureed, simmer for another 5 minutes and then squeeze in some lemon juice. Sprinkle some cumin & curry powder on top (optional) and serve the spiced carrot soup hot with bread sticks or any other bread of your choice! * Garnish the soup with some fresh cilantro, rosemary or chives. I had none when I made this but you must do it! * Adjust the consistency of the soup to preference. Add less water for a thicker soup. * Adjust the spices to taste. I ended up adding extra 1/4 teaspoon of cumin but that’s just me. Spiced Carrot Soup with ginger, cumin and curry powder. A delicious, healthy & vegan soup! Sprinkle some cumin powder and curry powder on top (optional), garnish with fresh rosemary/chive and serve the spiced carrot soup hot with bread sticks or any other bread of your choice! I love carrots too, thanks Vanessa! Hope you try this! This soup looks so pretty, Manali! I’ve never had carrot soup before, so I’m intrigued. I love the flavor and the fact that it contains some zesty spices. Just perfect for my soup-loving self! Thanks Gayle, I think you will like it! 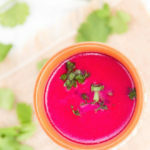 I’m totally swooning over the gorgeous color of this soup, Manali! I’ve never thought to make a carrot cream soup before, but this seriously looks SO cozy and perfect! Immersion blenders are life-changing. I’m glad you finally have one, Manali! 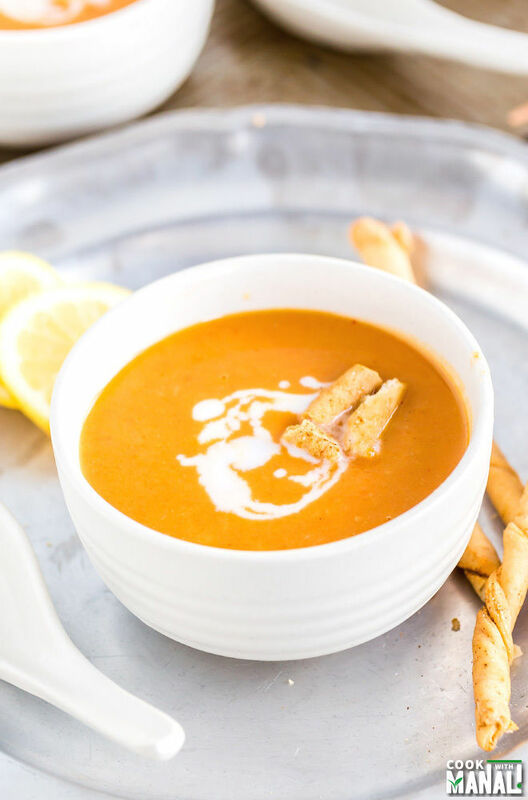 This carrot soup looks so comforting and delicious for this cold weather! I never thought to use coconut milk in a soup like this and I’m totally going to try it! I know right!! I don’t know how was I living without one till now! Thanks Rachelle! I know, I was same! Always lagging behind but now I try to keep up with everyone!! Thanks David! Lol, totally understand why you didn’t bake anything on Vday.. I didn’t either. It’s like all the holidays, by the time they actually arrive I’m already moving on to the next one! 😉 LOVE this soup, girlie! Such a pretty color and the flavors sound delicious! It’s so cold here and this sounds like the perfect way to warm up! Cheers, Manali! haha, I’m the same way!!! especially if there’s a holiday and I bake like crazy beforehand. . we went pretty light on the dessert on Valentine’s Day! 🙂 I LOVE this carrot soup!!!! love the ginger!!! haha I knew my blogger friends would understand 😉 Thanks Alice! This soup is gorgeous! I love the color!! It would be a great way to warm up on this cold, snowy day! I totally understand Manali! It happens with me every time!Even during holidays I cook so much in advance that on the actual day all I want to do is do nothing! This soup sounds yummy and perfect for cold weather! This soup is a bright spot on a cloudy day, Manali, and it looks so smooth and delicious! The soup looks so creamy and comforting! It sure was! Thanks Angie! I am in LOVE with all carrot soup, and yours looks spectacularly creamy and delightful. That color is so vibrant! I can totally relate with baking things so far in advance! By the time the holiday is actually here I’m kind of over it haha. 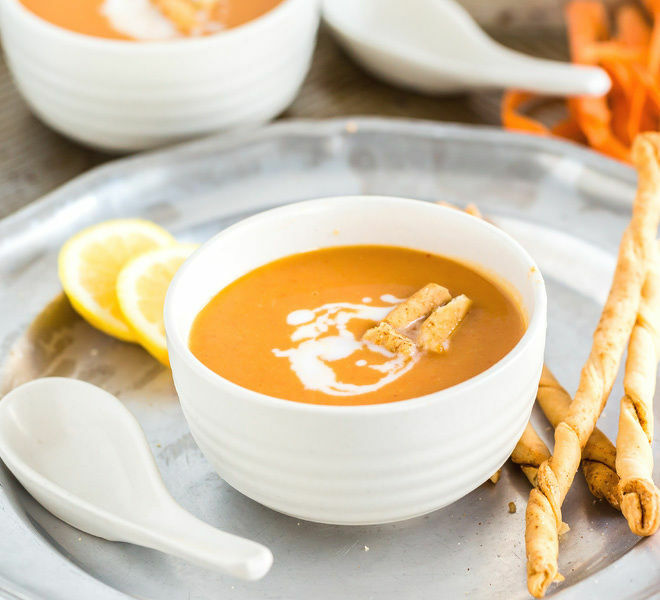 This spiced carrot soup looks so wonderful, Manali! The color is just gorgeous! haha I know right?! Thanks Danielle! Glad you had a nice Valentine’s Day! I actually didn’t bake a lot before Valentine’s day, but did make dessert yesterday, which I’ll share soon! This soup looks creamy and delicious! Pinned! Looking forward to it! 🙂 Thanks Mira! That soup looks wonderful and I am not to fond of carrots, especially the orangish ones but this soup is tempting me. Sounds healthy and delicious Manali. 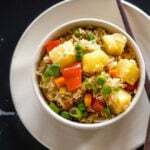 This soup sounds so healthy and delicious, Manali! I love carrots and these types of comforting meals. Perfect way to get a boost of vitamins too! I love spicy carrot soup!! It’s my favourite type of soup. 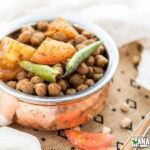 This recipe looks amazing Manali, and so healthy! Yum! Pinned! One of my favorites too! Thanks Harriet! Haha yes, I went overboard at Christmas and still have recipes saved up that I didn’t even make anything for Valentine’s Day for the blog 🙂 So sweet of your hubby to make lunch! 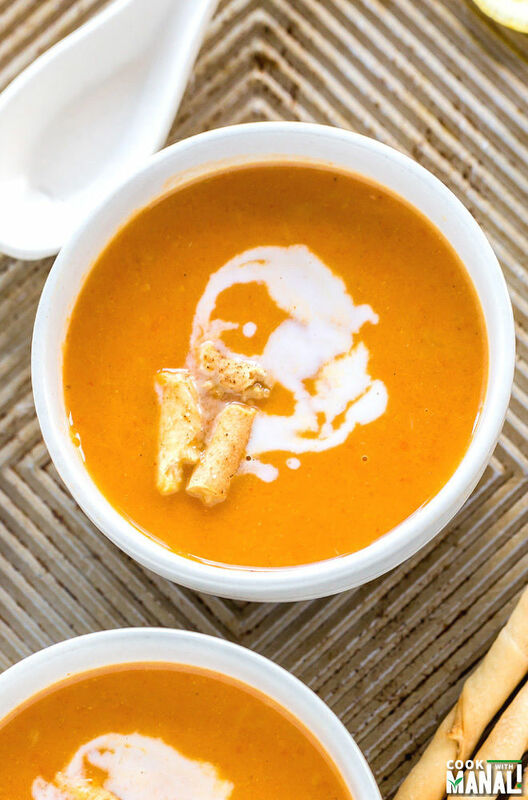 I can’t get enough of soups lately and love the gorgeous color of this carrot soup! So bright and healthy! I really loved the simplicity and passion you show in every item you put-up in the blog..A little story to start with followed by facts/myths/corrections and then recipe..I should say you found a perfect way to tell the recipe..I just started with Tea Risk recipe and ended reading many other recipes..I would keep looking into it regularly from now on.. 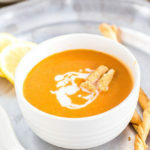 I love carrot soup, one of my favourites for sure! 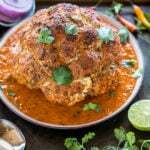 This version looks amazing – definitely need to try it soon!